I believe our headline was first coined by the Instapundit, who was kind enough to apply it to my book "A Disgrace to the Profession". But I'm glad to see, following the latest attempt to use Australia's disgraceful Section 18C to throttle freedom of speech Down Under, that The Australian's Bill Leak is introducing the concept to the Antipodes. His latest cartoon (right) features Tim Soutphommasane, the totalitarian hack who trousers a third of a million a year as Oz's "Racial Discrimination" Commissar. 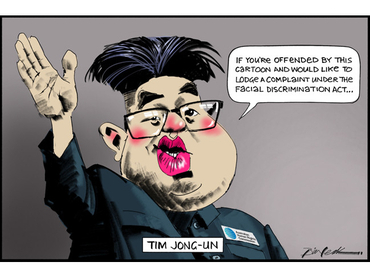 Mr Leak invites Commissar Tim Jong-Un to sue him for "facial discrimination". Two Australian basketball players, Alice Kunek and Tess Madgen, went to a fancy-dress party – one in blackface, one in whiteface. The one in blackface was meant to be Kanye West, the one in whiteface was meant to be ...I dunno, nobody cares ...Heath Ledger as the Joker? But Australia's race discrimination commissioner has weighed in and said he's deeply disturbed. This young lady is 25, and the state – the Government of Australia – is weighing in on how she went to a fancy-dress party. This was because of a racially-charged picture that two female students had posted of themselves in 'blackface'. In fact, they weren't in blackface. They were getting a facial. So they had that gunk all over their face and a couple of cucumbers or whatever on their eyes – and when they took the cucumbers off they had a giggle about how funny they looked and took a selfie. And Beverly Kopper, a complete bloody moron who happens to be a university president, is perfectly happy to destroy their lives over this. The girls are not guilty of racial discrimination; the university is guilty of facial discrimination. This chump has now announced that, although the great big express train of outreach committees and working groups is rumbling down the track and can't be stopped, the two young ladies will not be 'disciplined'. Disciplined? For what? Beverly Kopper blamed the students for 'failing to think about the implications' – of having a facial. Because we live in a world where a facial is one step away from a minstrel show. Sometimes a society becomes too stupid to survive. What this college president, Beverly Kopper, means when she says these students 'failed to think about the implications' of their racist exfoliating is that professional grievance mongers like her have so incentivized the taking of offence that there are now far more people who need to be offended than the number of people willing to offend them: Demand far outstrips supply. So in ten years' time these two students will be applying for jobs and their potential employer will Google them and the first 200 pages that come up will be about how racey-racey-racist they are. The problem is not these young ladies in either Wisconsin or Australia. The problem is the likes of Beverly Kopper and Tim Soutphommasane. Because they're bonkers, and they're totalitarian. Which is a dangerous combination. Hence, that Kim Jong-Un cartoon. Mark Steyn made a pretty good fist of it ("The war on free speech", 19/10). He reminds us that each day we see our freedoms being eroded is bad enough, though the irony is that we have a supposedly conservative government in office, doodling when it should be exercising power. What is being lost sight of is that there are those in our midst all too ready to exert state power by silencing intellectual rigour. It is anathema to a free society and like a boil, needs to be lanced with alacrity. What a brilliantly argued attack by Mark Steyn on the enemies of free speech. More power to him and to his encouragement of The Australian to frame its defence on the right to have a position rather than the position itself. Suppression of free speech encourages something worse than the threat of feeling offended. It encourages the harbouring and festering of secret hatred. Surely it is far better for any hatred to be out in the open so that we know who our detractors are and on what grounds, and that we are able and free to respond. A world away from the country I knew as a young man is a nation seemingly aligning itself with despotic values... The Prime Minister seems oblivious to this — the right to say what you think without fear or favour. Even if the [Queensland University of Technology] students are found innocent, which clearly they must be, nothing will make up for the blight on their young lives, their careers and the intolerable stress that has been placed upon them and their families by this vile action. If they are found guilty, we are no longer living in a free society, and every white Australian must accept that they are no longer free to voice any opinion whatsoever on anybody of any other racial group. It's that simple, and that stark. When Canada's Mark Steyn faced a similar attack under similar legislation, the Canadian public got behind him and the end result was that the legislation was repealed. Every decent Australian must now rally behind Bill Leak, and at every opportunity mock and ridicule the Wile E. Coyote villainy of Dr Soutphommasane and his ACME human rights trap. The lads at the Speccie are overstating it a wee bit there: I wouldn't say "the Canadian public" exactly "got behind" me, but it soon became clear that no self-respecting person was willing to get behind the "human rights" commissions - which is why they were reduced to being defended by Warren Kinsella, Bernie Farber and Canada's leading ovine fornication specialist "Dr" John Miller. Notwithstanding "the Canadian public"'s general antipathy to me and Ezra Levant, the "human rights" racket was too obviously malodorous to withstand publicity. So we gave them publicity - lots of it, non-stop. And a year later they had no friends, and a couple of years after that the law was repealed. It's good to see Bill Leak and The Australian doing the same. ~Next week I'll be returning to the North American airwaves, starting on Wednesday with a live appearance on AM640 with Toronto's Number One morning man John Oakley. If you're within reach of the receiving apparatus, the fun starts at 8.30am Eastern.